Bake-off Ovens for bakeries, shops, food stores, cafeterias and especially for baking live in front of the public -there's nothing more appealing than fresh baked high quality products! 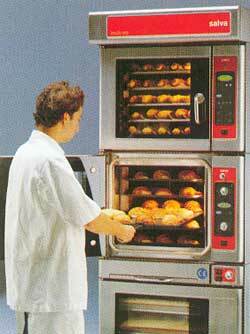 Bake-off Ovens are supplied in a wide range of capacities for either 30" x 18" or 600 x 400mm trays. Suitable for frozen or freshly made products - ideal for bread, rolls, french sticks, confectionery, savoury, tray bakes etc. 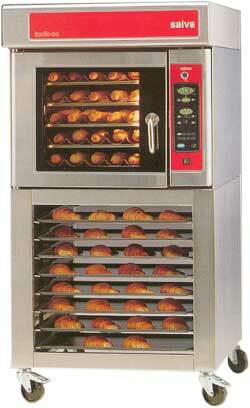 Ovens available with steam injection for crusty rolls and french sticks. Special canopies available so that external extraction is not nescessary. Option of multi-function computer programming or manual settings. Single phase and three phase electric and gas. All ovens mounted on castors for easy moving/cleaning. Racked bases or prover bases or ovens can be stacked to give additional capacity or a variety of baking options. Everything available for the bake-off facility - refrigeration, proving, glazing, hot/cold display counters etc.